Interpersonal relationships are inherently paradoxical. They afford simultaneously the opportunities for both ecstasy and agony. They create dilemmas, double binds, quandaries, and contradictions for relational partners. Individuals want to be open and honest, but they also want to protect their partner and preserve their own self-image. They want passion and abandonment but not without security and order. 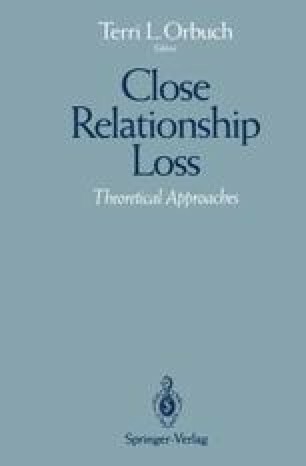 Recognition of these various contradictory phenomena has led scholars to import dialectical principles to provide a more complete understanding of the dynamic construction and erosion of relationships (e.g., Altman, Vinsel, & Brown, 1981; Baxter, 1988; Cissna, Cox, & Bochner, 1990; Conville, 1989; Masheter & Harris, 1986; Rawlins, 1983a, 1983b; Rawlins & Holl, 1987, 1988; Wiseman, 1986). In the spirit of this line of work, this chapter is based on the premise that the negotiation of dialectical tension between relational partners is central to the conduct and interpretation of relational life (and death). A dialectical perspective can therefore offer insight into the creation and dissolution of interpersonal relationships.